The Fed's decision to announce a small tapering of QE in January paves the path for the Santa Claus rally and the Core Options Trading Strategy in the closing weeks of 2013. The Core goes on to produce all winning trades with returns from 50% - 320%. ...the new Fed has not been voted in yet, if there is a taper, it will be a very small taper. My guess they will not taper in Dec as the government wants folks to keep spending on the holidays. In the commentary, Dave also provided his overall chart analysis for the current market conditions. Major indexes looked extremely sour trading below 10 and 20 day moving averages. In addition to the pre-trade analysis, this December was shaping up to be a tough month. Just past 3:30 EST, Dave posted his recommendations for the Core Strategy. Six plays were pushed to our members, all on the call side, for the following week. Monday morning the markets opened with all six plays up at least 25% and continued to trend north throughout the day. Tuesday, the market stalled and traded flat in anticipation of the FOTC meeting. Wednesday rolled around and the market waited cautiously for the Fed to make a decision. At 2:00PM, Ben Bernanke announced the Fed's decisions. Just as Dave predicted five days earlier, the Fed announced a small tapering of QE to begin in January 2014, the Santa Claus rally was on. Immediately the DJI and S&P 500 began soaring higher, taking our picks with it. 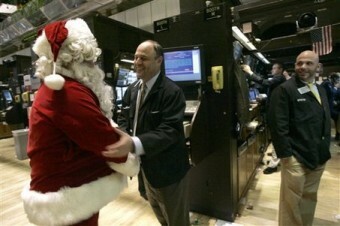 What did the Santa Claus rally bring you this year? Friday the market closed up for the week, reaching new highs. As expected, the Core Strategy performed admirably with all six picks producing some fantastic returns (see table below). Members were rewarded with potential gains from 50% to 319%, making our target profit of 30% to 50% an easy win. If you are not a Core Strategy or Bundle member, you have missed out on another phenomenal month. Be advised, we are running a year end special for $200 off the Bundle through Dec 31, 2013.